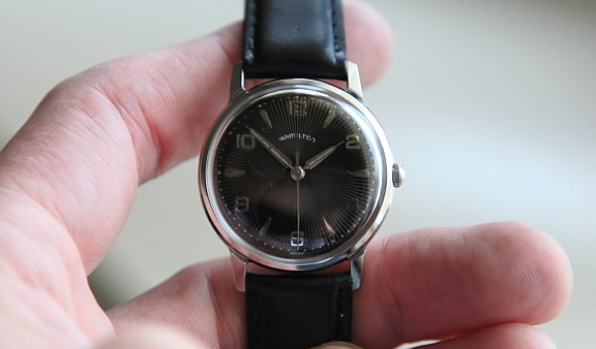 One of the distinctive style aesthetics of the 1950's and '60's was unique, textured dials. Hamilton had a variety of models with embossed dials that featured swirly patterns, star bursts, combinations of smooth and textured finshes, even wooden dials and dials with mother of pearl! 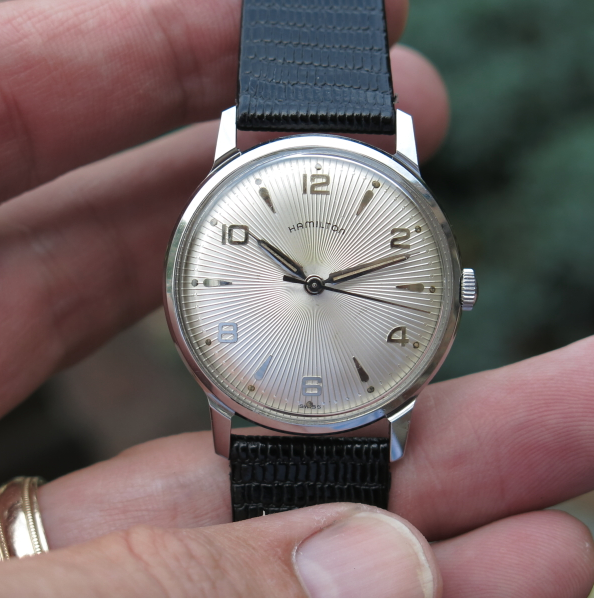 An example of an otherwise ordinary-looking watch that was made interesting and distinctive by it's dial is the 1958 Sea-Glo. It was produced through 1961. 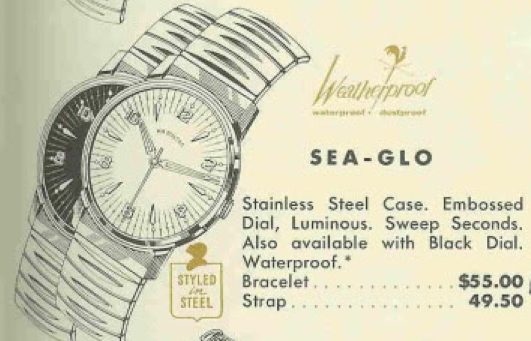 The Sea-Glo came in a stainless steel case with either or a black or a white embossed dial. Embossed means "stamped" or "pressed" so the features on the dial are made like the features on a coin are made. The silver colored hands are luminous to glow in the dark along with corresponding dots at each of the hour markers. 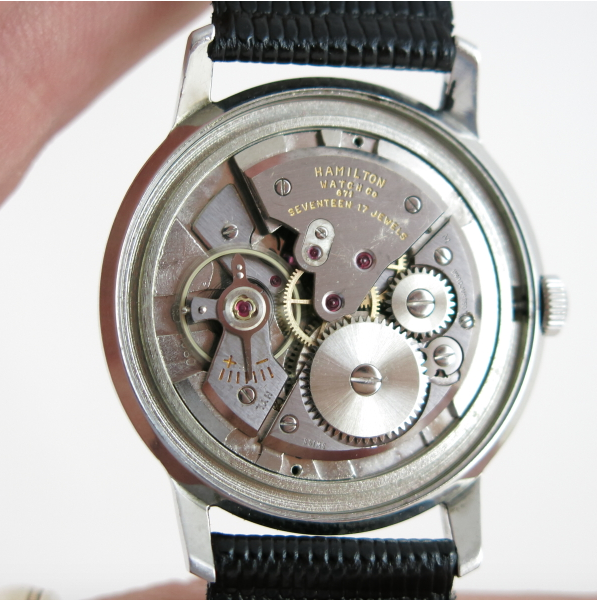 Underneath the dial is a Hamilton 671 movement. This 17 jewel movement was made by the Swiss company, ETA, and is the same as the ETA 1080. Hamilton used Swiss-made movements to achieve a lower cost point so their entry-level imports could compete with the rapidly evolving watch industry. 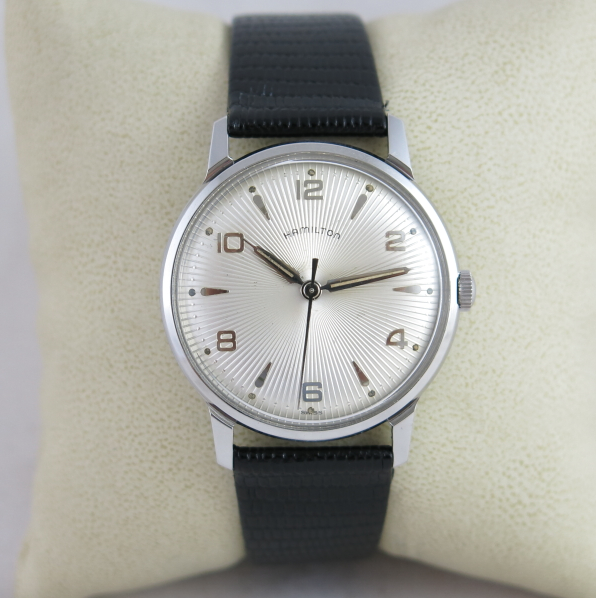 Interestingly enough, Hamilton today is owned by the Swatch Group and ETA is a sister company. Hamilton watches today all feature various ETA movements. I recently purchased a Sea-Glo off of eBay a week or so ago. It came via a "buy it now" sale for $50. It was described as "only running a few seconds". Running at all is usually a good sign... but you never know. It also came with a brand new strap (still in the package) so I took a chance. 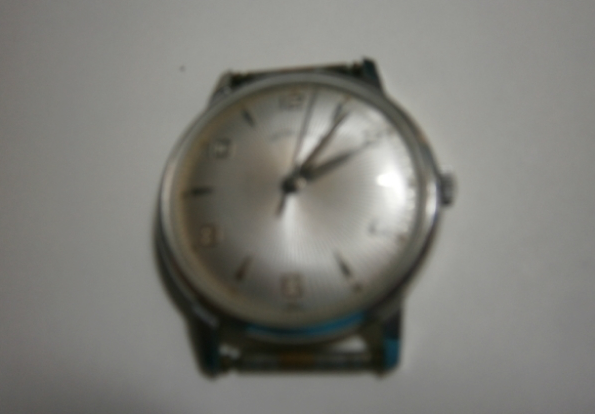 Would you recognize the watch in the photo below as a Sea-Glo? Well, once it arrived I found that it would run dial-up but not dial down. That's usually not a good sign and would indicate a balance issue. I popped the back off and sure enough... the balance wobbled. Changing balance staffs is pretty advanced stuff... it's very precise work and takes a lot of practice to get right. Fortunately I have a couple of spare 1080's. They aren't Hamilton branded but with great care I figured I might be able to transplant the balance assembly. Turned out though that the reason the balance wobbled was the jewel on the main plate was missing! Well, not really missing, just no longer in place. The balance wheel on this and many other movements from this period is "shock jeweled". That means that the jewels are relatively free to move but held in place with a tiny spring. If the watch is dropped, the spring pops out and protects the balance staff from being broken. So all I had to do was put the jewels and the spring back in... only problem was I couldn't find the spring. I did the next best thing, and just used the main plate from another ETA 1080 - problem solved. Here's a shot of the Hamilton 671, aka ETA 1080, all cleaned up and purring like a kitten. With the dial and hands cleaned up and the crystal polished, this Sea-Glo is a remarkable improvement over what I started with, don't you think? Here's a shot from outside... you have to love the sparkling effect that these textured dials can provide. And here's a shot of a black-dialed Sea-Glo that I restored a year or so ago. They are both very cool watches... I'm not sure which one I like better. How about you? To each their own. There were 113 different models in 1958, and that doesn't count all the variations in dials - so there was surely something for everyone in Hamilton's line-up. this is beautiful. I recently got one off ebay I'm working on fixing up. Any idea where to get a missing ratchet wheel screw? You can order one from a parts house or just get a complete donor movement. Any ETA 1080 will do. It does to be a Hamilton.